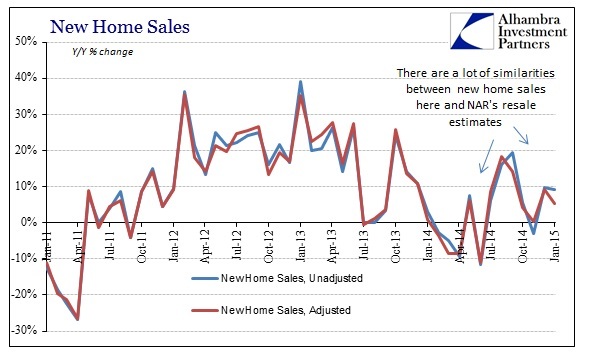 The pace of new home sales continues to be stuck right below that 500k SAAR, a flattening of activity that dates back really to January 2013. The data has at times peaked above 500k only to be revised subsequently lower, which does not provide a whole lot of confidence about recent months. January’s level was slightly below December, but volatility (including revisions) prevents any kind of interpretation about the shortest term. 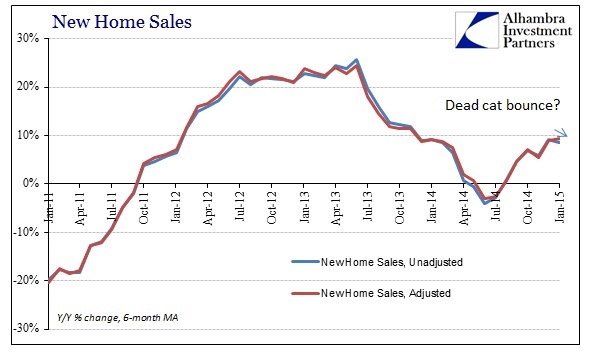 I think more important than the pace of sales is the estimate for median sale prices. The trend is still upward, but more destabilized than it had been during the big run in 2012 and the first half of 2013. 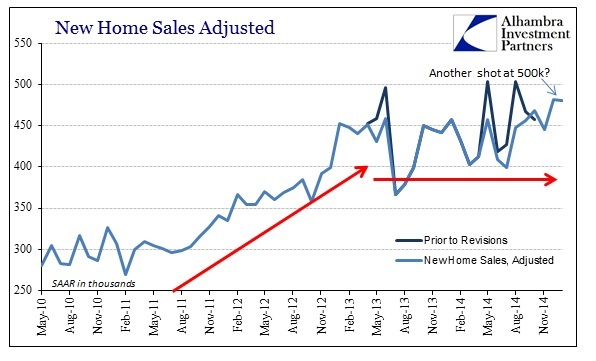 However, whatever the actual pace of sales, new home prices are still rising likely being drawn upward by the upper tiers. 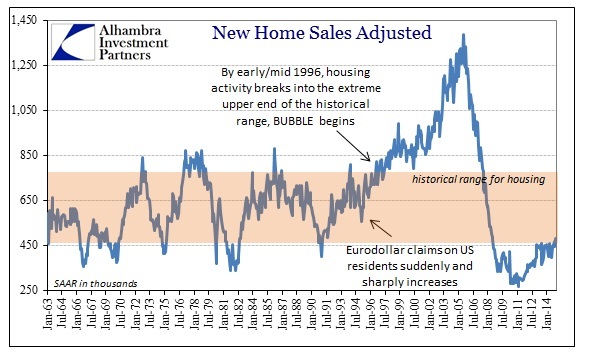 If it were anything other than such bubble behavior, sharply rising prices would be pulling up construction activity precipitously as it had done in the mania phase of the housing bubble after the dot-com recession. 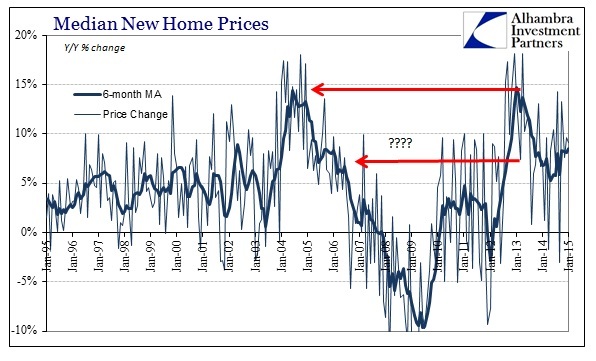 In other words, prices are rising sharply for new builds, but on one-third the volume. It is emblematic of the overall economy, as those doing well accessing asset inflation are doing well everywhere. Unfortunately, economic theory about such “aggregate demand” is not proving to be anything other than academic, as there is no positive spillover for the rest increasingly left behind. 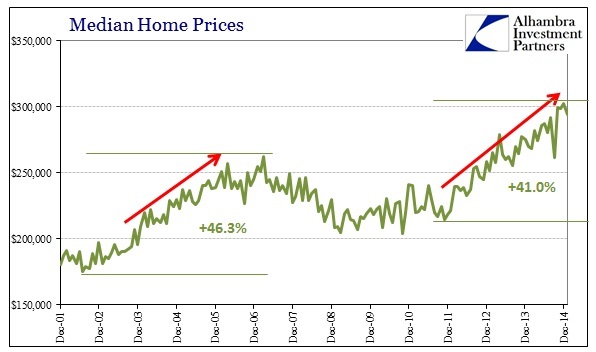 Regardless, the current move in prices is no less dramatic and confirms the fact that this latest housing “market” experienced nothing less than its own bubble, mini as it may have been.